Meh. Not since 1995's ceremony - where, after winning 5 other awards, Forrest Gump won the Best Picture award competing against both Pulp Fiction and The Shawshank Redemption - have I been so unexcited about an Oscars show. I mean, somehow Gump is back again... er, wait... I mean Benjamin Button... competing against some equally slight films. And it seems like it's a foregone conclusion that one of my least favorite movies of the year, the extremely overrated Slumdog Millionaire, will win a slew of awards (probably even the Best Picture award). So what's in it for me this year? Why bother picking any of the races, if I can't even muster the interest in the proceedings this year? Like I said... meh! So I'll skip the races I'm bored with and just bring up a couple of points of interest, so to speak. Best Actor looks like the most interesting one with Sean Penn and Mickey Rourke being the front-runners. While personally, my heart's with fellow Miami boy, Mickey Rourke, I fear that his overexposure this awards season may have worked against this man of mystique. So Sean Penn may run out with this one, which wouldn't be all bad since he gave a hell of a performance in Milk. And karmically speaking, maybe this is a reward for being one of the few directors to keep Rourke working during his low period in 2001's The Pledge. Kate Winslet should win for The Reader, only who knows why she was even nominated for that. Penelope Cruz and Viola Davis are another interesting race to look at for Best Supporting Actress (Taraji P. Henson, I loved you in Hustle and Flow, but I don't see what merited the nomination this year). Wall·E is a shoo-in for Best Animated feature. But honestly, it should have competed in the Best Picture category where it could have, and should have, easily won. The only upset of the night would occur if for some mysterious Academy-related reason, Heath Ledger would lose the Supporting Actor award. Posthumous nominations have a bad record at the Oscars. The technical awards this year? This one gets a "Who REALLY cares?" from me. When you have The Dark Knight - a movie that has a near-unintelligible third act - up for Film Editing, and Benjamin Button up for Best Makeup - when in fact, most of its makeup achievements are perked up by CGI - then what really comes to mind is how much the nomination process, and even the categories, are in need of an overhaul. With Bill Condon (Dreamgirls) named executive producer this year, the actual Oscar ceremony might prove to be the most interesting aspect of the evening. Hugh Jackman (X-Men Origins: Wolverine), a pretty talented showman when performing live, is the evening's host. Michael Giacchino (Lost) is conducting the orchestra. And they've even tried to spice things up a bit by keeping its roster of presenters secret. I'm hoping this all adds up to a surprisingly exciting evening. I usually make a day of this. Despite disagreeing with most of what is usually awarded, as a movie lover it still excites me to see a day in which my passion for movies is shared in celebration by others. But expect Slumdog Millionaire to sweep most of its nominations, and The Curious Case of Benjamin Button - though slight, still a bit of an underrated film - to lose most of its noms. If this happens, then predictability will still reign on another stale awards night. 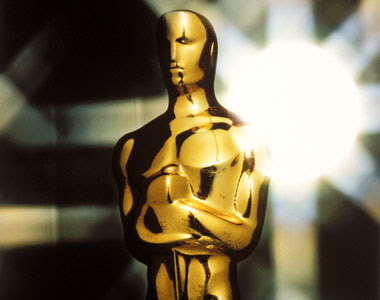 The 81st Academy Awards airs Sunday night on ABC at 5 p.m. PT/8 p.m. ET. I feel much the same as you do, though in recent days the hype has gotten to me a bit; whereas I was resigned to probably missing the ceremony, even taking a sort of perverse pride in the fact, I'm suddenly relieved to discover I probably will be able to watch. Old habits die hard, I guess. Somehow, though, Hollywood's malaise makes me excited. In dual roles as an aspiring (though currently inactive) filmmaker and a genuine film-culture enthusiast, it seems that as things continue to trend downwards, an upswing is inevitable, and that it will probably come from outside the ossified film industry. All the stars are aligning - viral videos, affordable technology, the blogosphere - and I think the next 5 or so years could see the development of something new, fresh, and forward-looking. At least I hope so. The title of this post is a little inside joke around the blogosphere. Many of my fellow bloggers have spent the last few days blogging about how they can't muster the energy to cover these Oscars... then proceed to do so anyway. I will not be live-blogging the event this year (for that, I recommend readers visit Screen Savour where my pal T.S. plans to cover it tonight). I will endeavor to snark along the best I can on Twitter. tony, it's a relief to see i'm not the only one who felt slumdog was over-hyped and way overrated. i was starting to feel like pontius pilate. as for the awards, i didn't bother. last year i was very happy to see NCFOM clean up and i had a little hope for hollywood...that hope was completely erased this year. i share movieman's optimism but what worries me is how slanted the business is against the little guy now and how the overwhelming glut of people making movies (because of affordable tech) is making it difficult for good films to find an audience. we desperately need our generation's easy rider, but do we have a (truly) indy distribution system in place that can topple hollywood? i suppose it's a complex issue. what keeps me inspired is knowing we can always look to foreign markets for great films. my top 3 for 2008 were foreign and if i'd had a chance to see a few more that figure could have grown. Current distribution is a complex issue (and one I don't have a toe in at this point, so I can't comment too authoritatively on the subject). At any rate, I'm planning on reviewing my first "mumblecore" film on Tuesday, and will discuss these & other issues and where this new "movement" brings us in regard to all of that. I have to disagree somewhat (as I disagreed on another occasion with Tony) on the idea that there's an "overwhelming glut of people making movies." Perhaps I'm not tapped in enough, but I don't really see this phenomena occurring - and definitely not on a widespread basis. It still seems like the movies we hear about, or even the movies that get made by-and-large, have to pass through some sort of gatekeepers whose role is not so much to ensure quality as to keep it difficult for people who aren't "connected" (or even many of those who are!). I actually think we'll start to see a turnaround in cinematic quality when more and more people realize the potential of the tools at hand. Yes, there'll be a whole new load of dreck, but I'm convinced that the good, original work will rise to the surface.